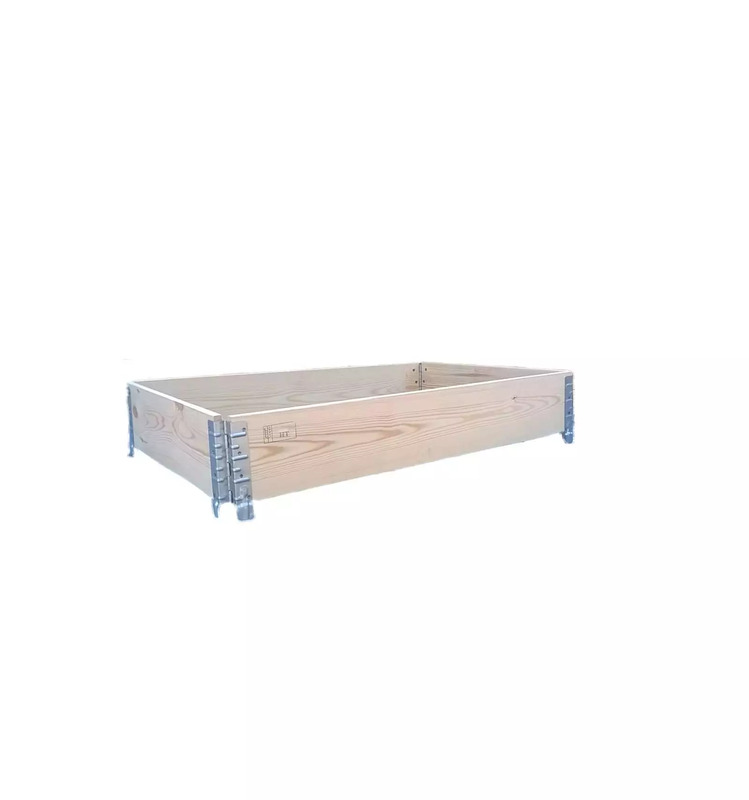 Thanks to our foldable pallet collar, transform your new or second hand pallet 800X1200 mm, into a storage box (crate) pallet. You then obtain a volume of 0.20m3 or 200 liters of capacity. Depending on your use, you can stack several extensions to increase the useful volume of your crate. However, we recommend not to exceed 5 stacked extensions, which already allows a filling height of one metre and an interior volume of almost 1m3 of capacity. Remember that the pallet below must be adapted for the load support of your products. 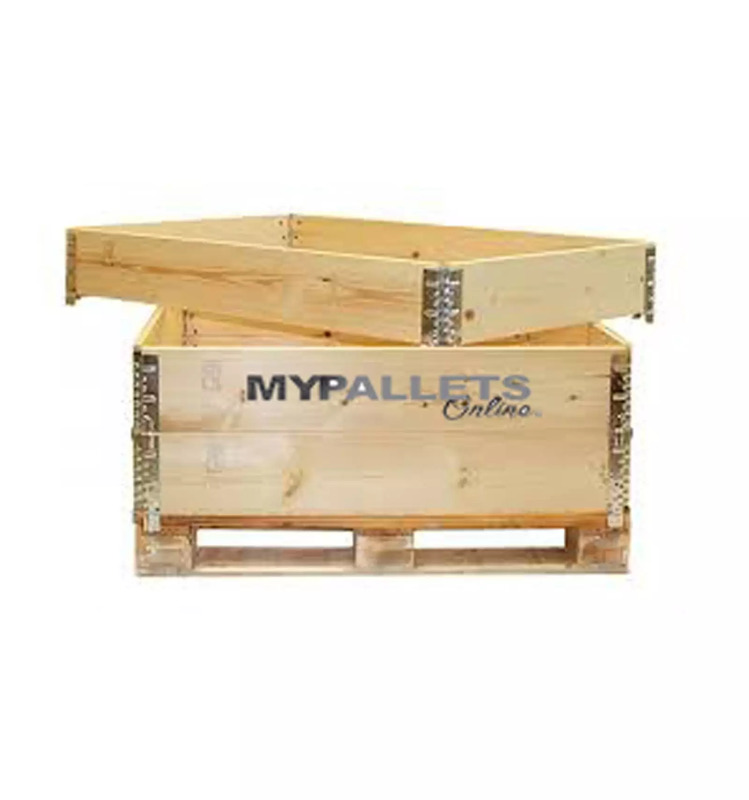 The Europe pallet can support up to 1.2 tons, the semi-heavy duty pallet 750kg and the lightest +/- 300kg. Once use is complete, the extension folds up to take up very little space horizontally or vertically. When shipping high value products, recover your extensions while saving on transportation costs by folding them. Our New Foldable Wooden Collar are produced from 200 mm high planed and surfaced boards of softwood species (pine or fir) on all four sides. The model that we present you is produced from 1st choice board. The 1st choice means that there are almost no visible knots. The presence of visible knots does not call into question the intrinsic characteristics of the extensions as long as they are integral with the wooden board. 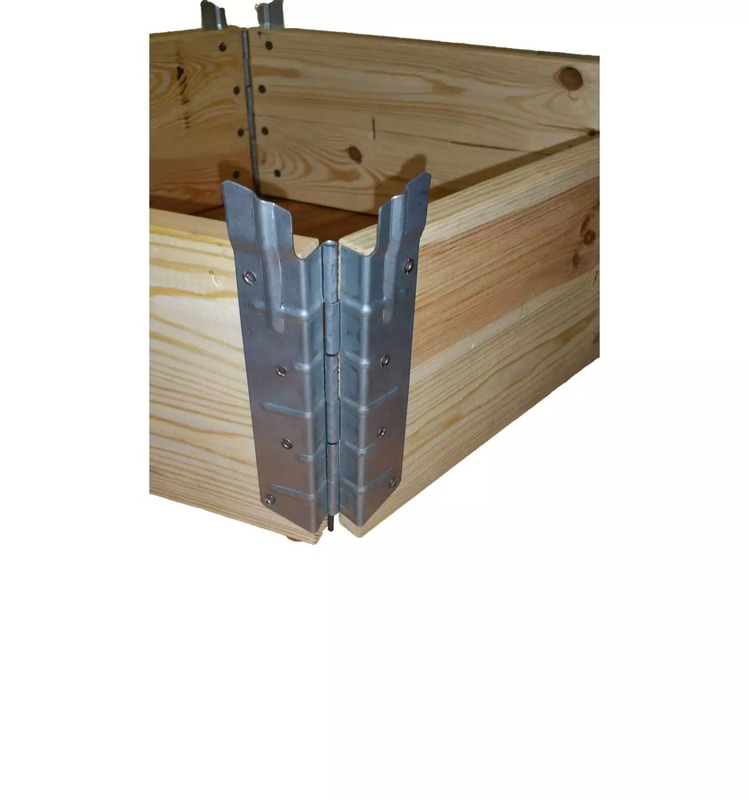 The 4 galvanized steel hinges are riveted at the corners with 8 rivets. The 30 mm hook is specially designed to fit perfectly in the corners of pallets. Once installed, the extension does not risk becoming detached from its pallet during handling in forklift trucks or more simply with manual or electric pallet trucks. All our folding extensions are heat treated to be approved to the ISPM15 standard (see our article on the standard). This way, you can export your products without customs problems. We provide you with the mandatory certificate. Depending on your requirements, we can mechanically dry your future extensions in a suitable oven. We will give you the drying certificate and the average humidity values. We prepare your parcel on wooden pallets containing 120 foldable collar. On request, we can reduce the quantity to a minimum of 100 pieces. Your package is carefully prepared and packed to avoid damage during transport until it reaches your home. The total length, once folded, is 1 times the length + 1 times the width for the extension 80X120, 2 meters length. We have a wide range of wooden collar to match your needs in size and at the best prices. In the same size 80X120, we can offer you new and less expensive collars in two 100 mm boards or in standard choice wood (with visible knots). Your use is punctual and you don't need a new product, we also present you second-hand collars. On a simple inquiry, we study the best solution for you.